There’s no Baja in Colorado, at all. Which makes it particularly difficult to test a vehicle built primarily for 100-mile-per-hour adventures through the desert. But not all is lost. Colorado has plenty of terrain ready to make even the most off road capable trucks weep. Preparing to thrash a vehicle in the back country is something I love. But when that vehicle is outfitted with such niceties as an in-dash navigation system that’s augmented with voice-activated SYNC, a leather interior with heated seats, dual zone climate control, satellite radio and other features more commonly found in a BMW than a truck; it becomes a rather strange feeling to thing about putting it over the rough stuff. Don’t let the fluff trick you though, the Ford F-150 SVT Raptor 6.2 is a vehicle that truly shines when the pavement ends and the nasty stuff begins. Power, and lots of it sit under this hood. A 6.2-liter V8 from the Ford Super Duty truck line was adapted for the Raptor and it really shines. The truck handled everything from highway acceleration to slow climbs to 12,000 feet without even a hint of being underpowered. The fully boxed ladder frame was solid and stiff and the 17-inch wheels paired to BF Goodrich All Terrain tires never lost grip when the going got not only nasty but also Rocky Mountain steep. Inside the Raptor 6.2 is a series of knobs to switch between two-wheel drive, four-wheel drive high and four-wheel drive low. When the going gets really interesting, you can lock the rear end by engaging Off Road Mode, which uses some computer magic to change throttle, transmission, standard stability, traction and ABS brake behavior. One feature particularly helpful in the Rockies was the Hill Descent Control function that helped keep me from going up or down steep inclines too rapidly. Sometimes though you’ll find that even multitudes of computer wizardry can’t handle it all and that’s when the 11.2 inches of bump-munching travel up front and 12.1 inches at the rear take over. A special set of Fox Racing Shocks that sport triple interior-bypass valving take care of all the damping. We piloted the truck up I-70 and into the heart of the Rockies where snow is already several feet deep in places and the threat of ice added yet another challenge to the already barbaric roads we had in mind for our test. This truck may have been built with the Baja in mind, but it sure can handle the wet, cold mountains too. The truck passed over anything and everything we threw at it. Traction was never an issue even when passing over scree, ice and snow. Often at terrifyingly steep angles. To truly experience the truck and to truly use it’s full potential you have to be comfortable with turning off that safety switch in your head. This truck was meant to go quick. It seemed to handle better over boulders and tire-swallowing holes when we put the peddle down rather than when crawling. The 6.2-liter engine is a very willing partner when it comes to quick ascents, even to 12,000 ft., with its 411 horsepower and 434 pound-feet of torque the truck not once felt underpowered. Probably the most amazing thing about the Raptor is that when we packed up and rolled back onto the pavement to head home our off road machine instantly turned back into a good old Ford pickup truck. The ride is smooth and comfortable on surface streets. The steering is a little light and twitchy on pavement, but it’s no different than any other off-road full-size truck and it’s mostly a non-issue. That brings us to our biggest issue with the Raptor, the fuel economy is pretty abysmal. During our everyday driving we averaged a measly 14.2 miles per gallon. When we headed to the hills for fun our numbers dropped around 10. 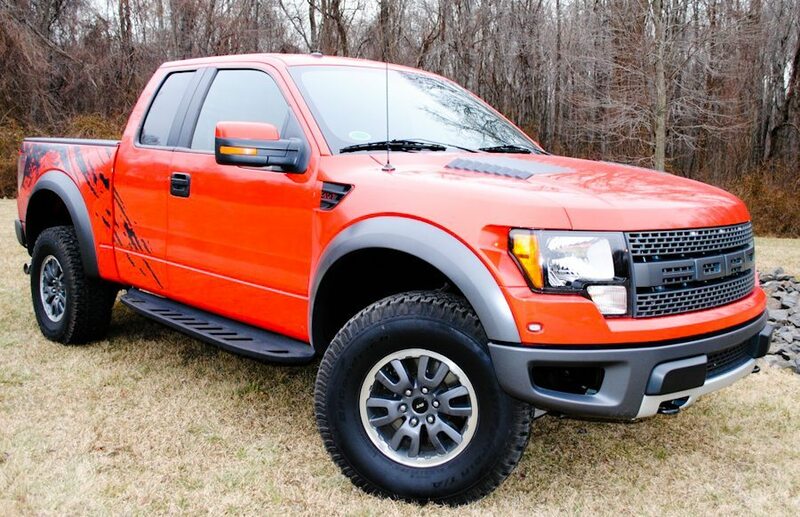 The F-150 SVT Raptor is a wickedly strange truck, but I like it. On one hand it’s an incredibly capable off-road machine willing to climb, bump and grind over just about anything. On the other, it’s a comfy and refined ride that could compete with a beemer if it wasn’t for the bright orange paint and mud-spray graphics. It should go without saying, but we enjoyed the hell out of this truck and at a base price of $41,995 it sure can’t be beat if you need a great all-around truck. Just be sure to have a good sized gas allowance.